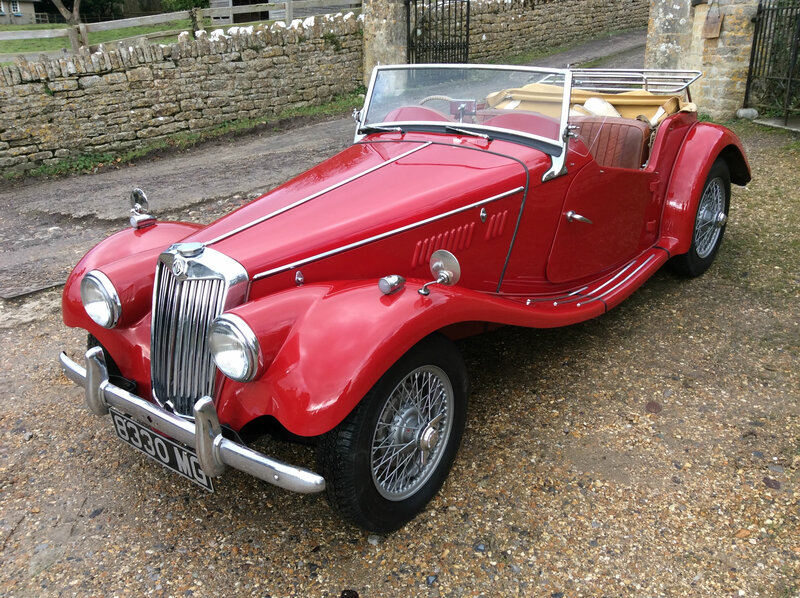 We normally have a selection of quality MGs, and other classic cars, that we have for sale. 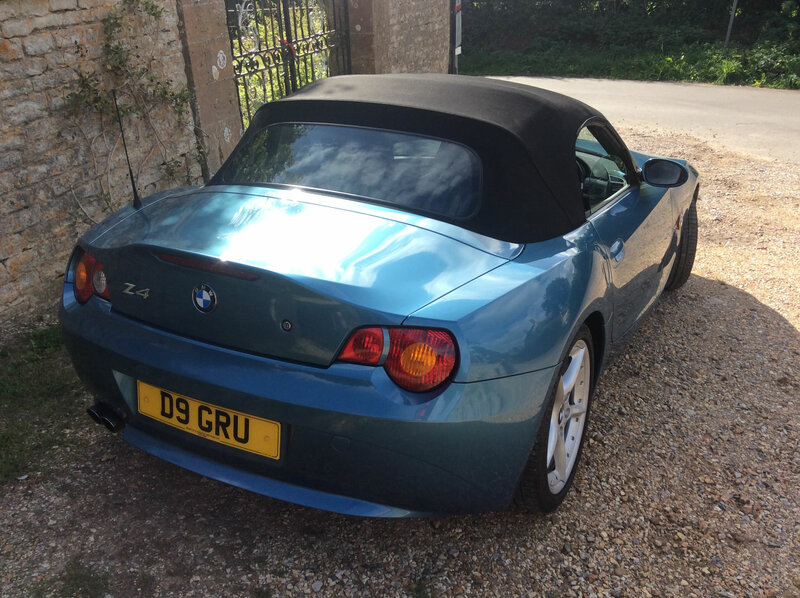 Prior to the sale, these cars are comprehensively checked, in our workshop, to ensure peace of mind for the new owner. 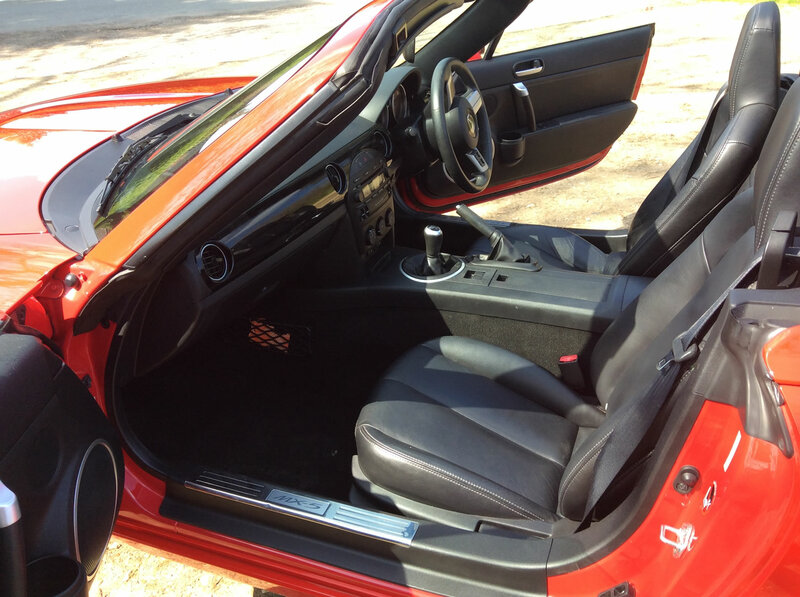 Here are cars that we currently have available. 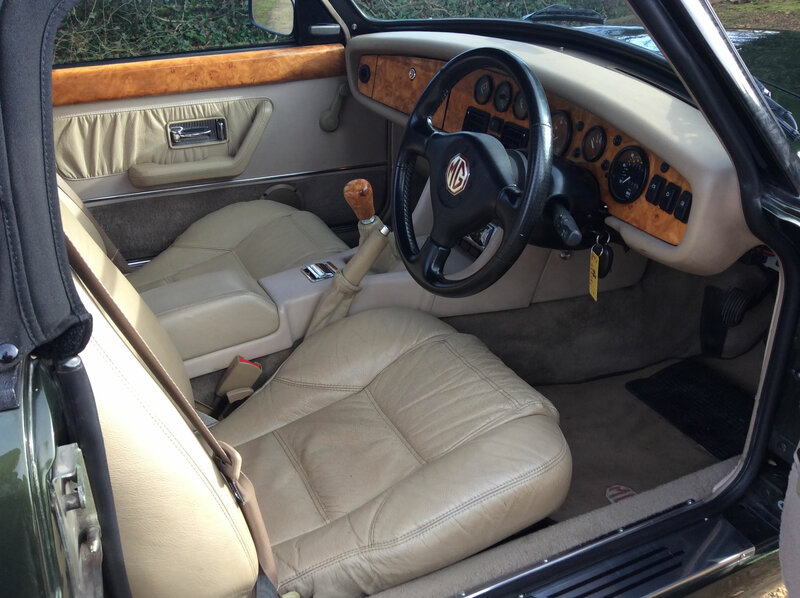 You are welcome to get in touch with us to arrange a viewing. 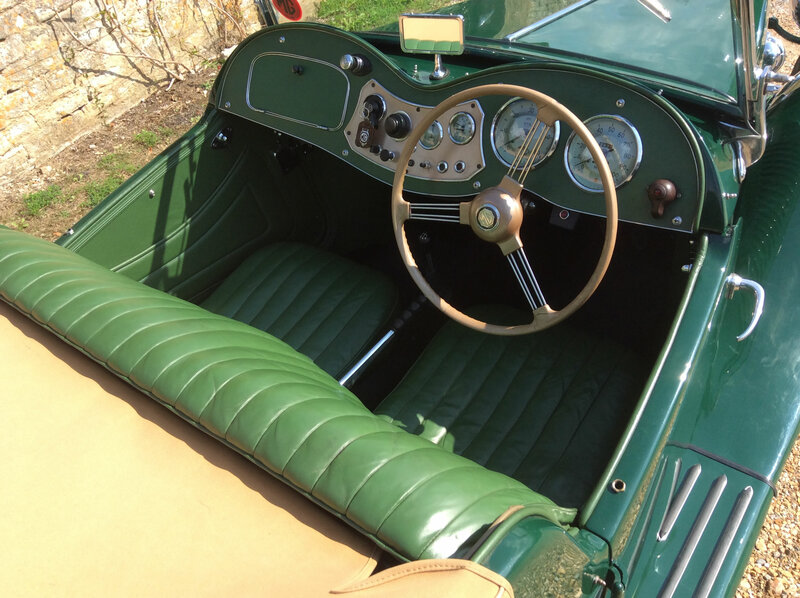 MG TD 1953, Finished in British Racing Green with green interior and Tan weather gear. 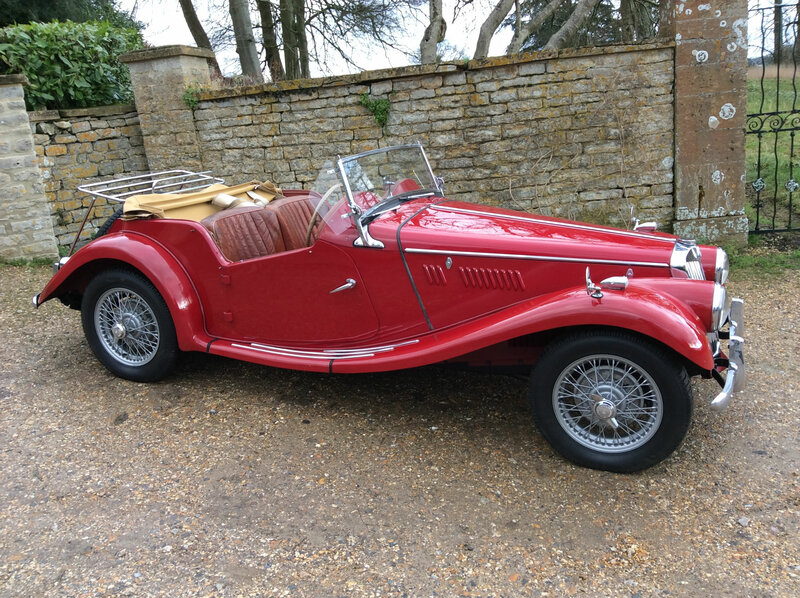 This MG TD had a light restoration in 2009/10 and it is a beautiful car. 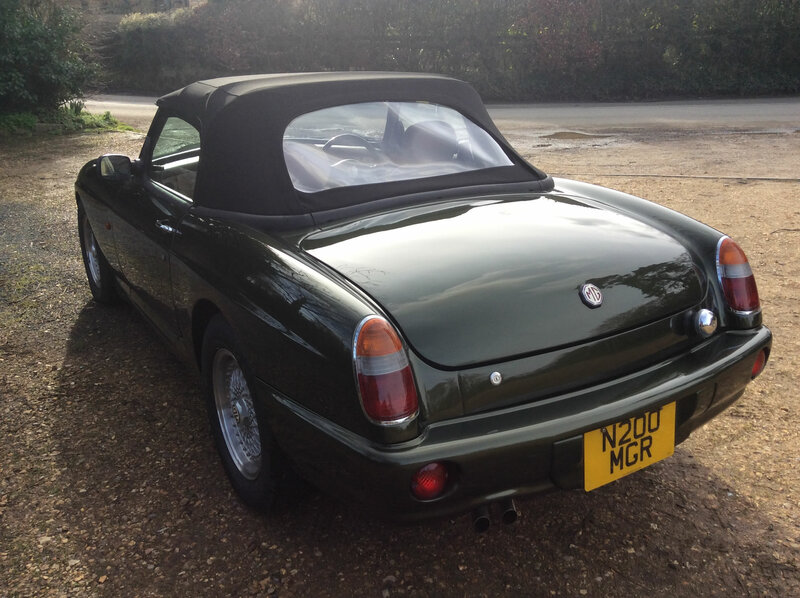 It has a good history with the original buff log book and drives extremely well. 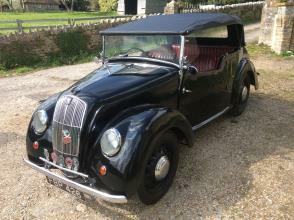 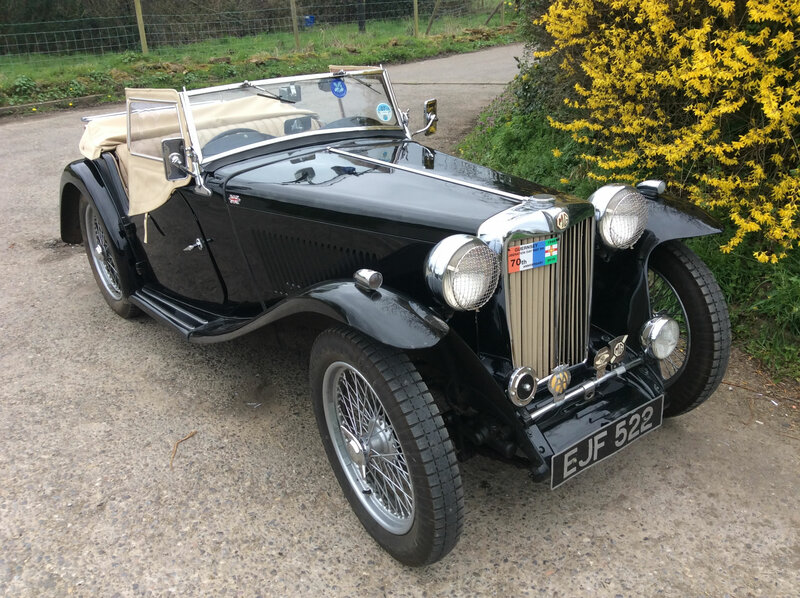 MG TC, 1947, finished in black with beige interior and weather gear, it has been fitted with a re-con engine which has only done 10,000 mls. 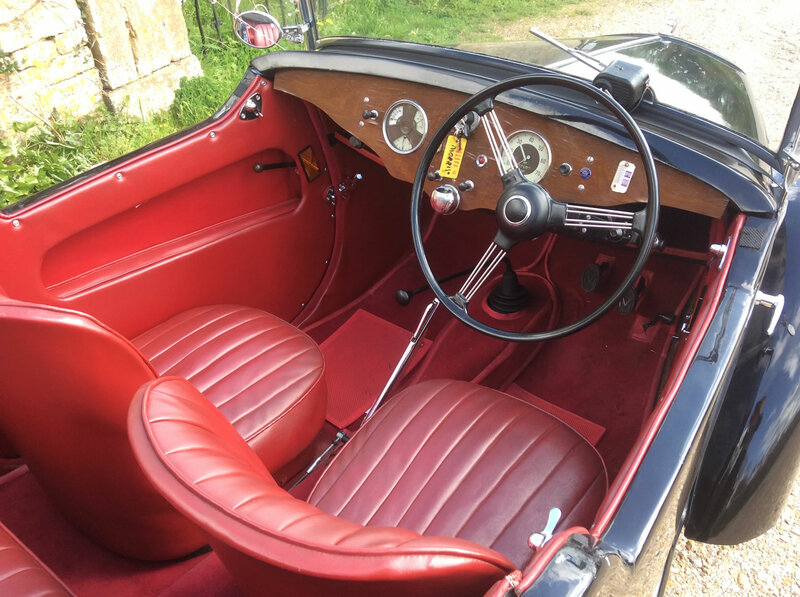 The car comes with a very good history file including old MOT's, invoice's and details of work done over several years. 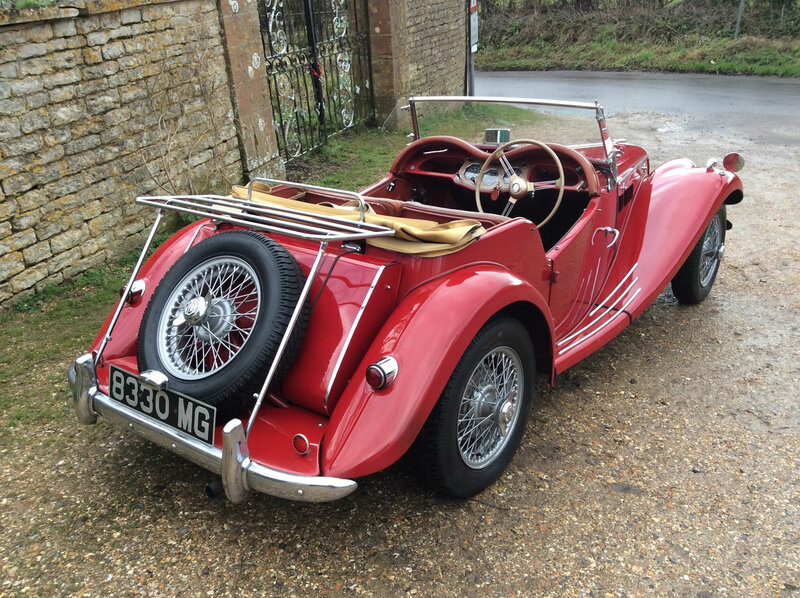 The car has recently had Blockley tyres fitted all round. 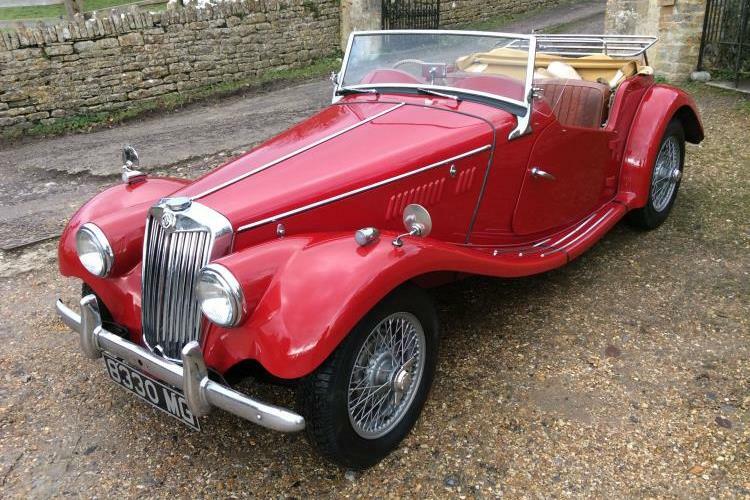 It does have one or two minor paint blemishes but still presents itself very well. 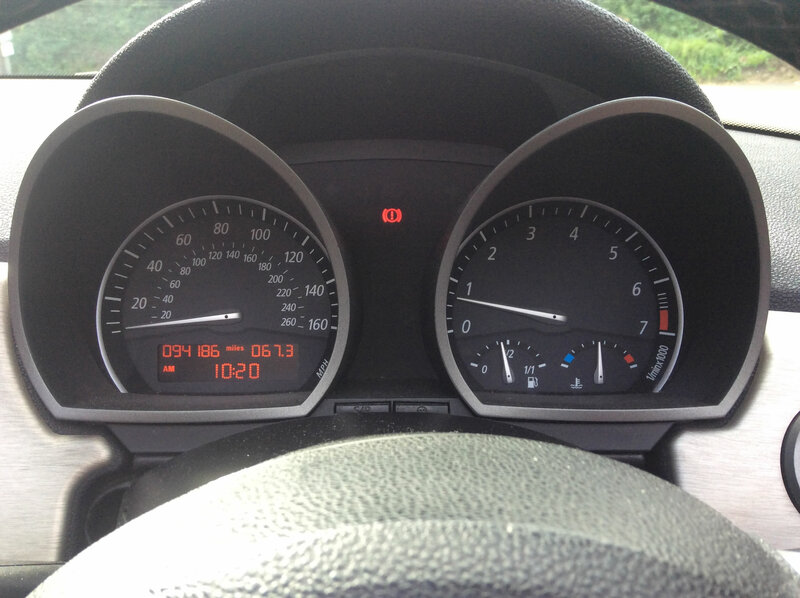 The car runs and drives exceptionally well. 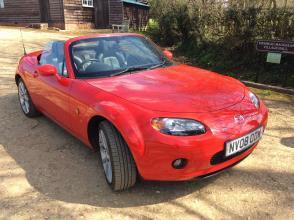 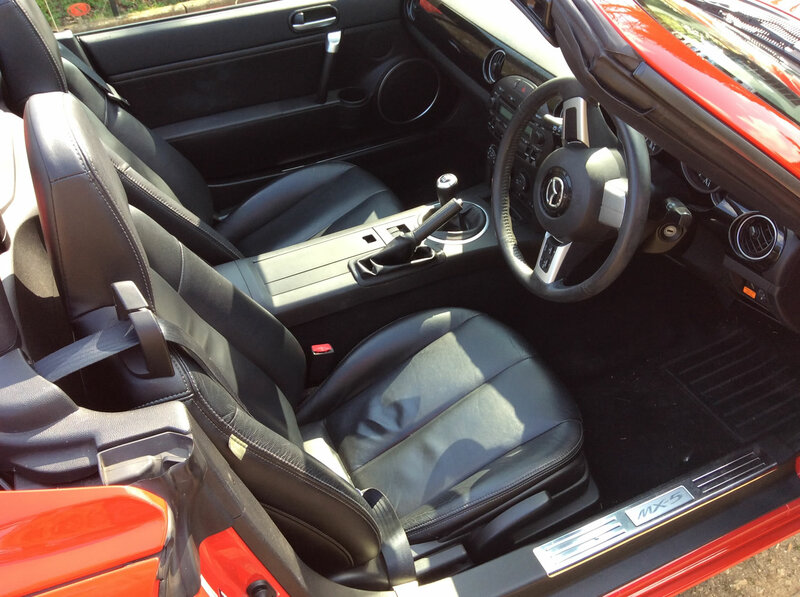 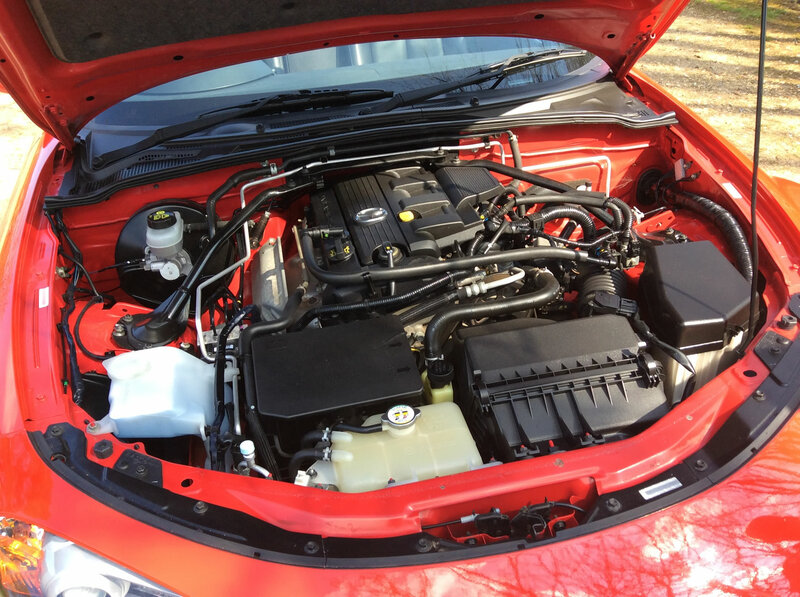 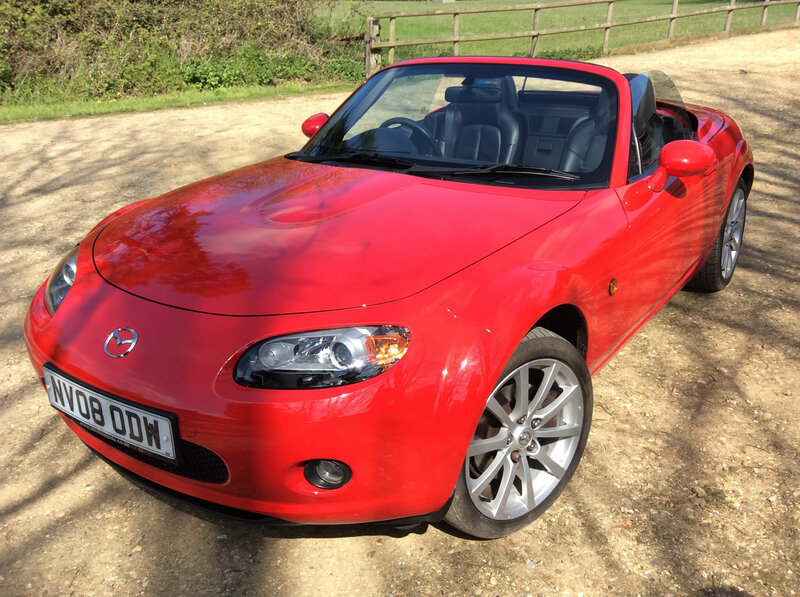 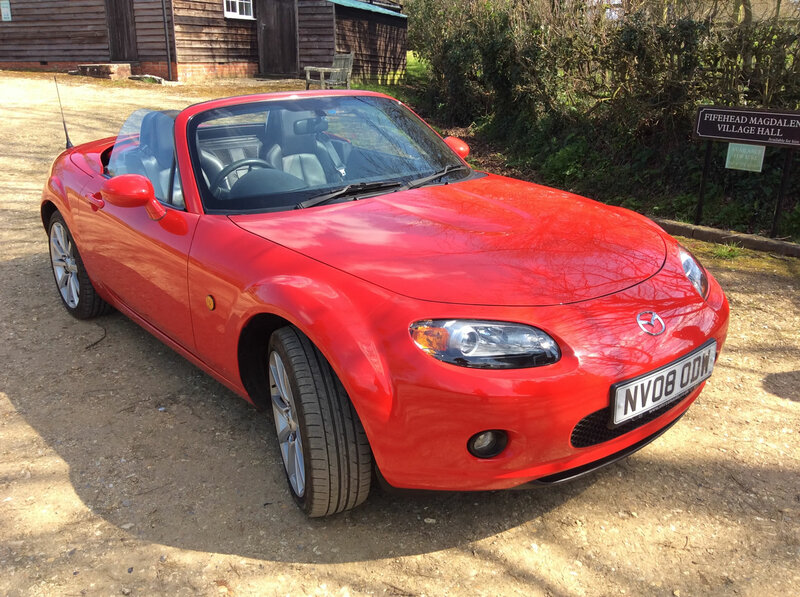 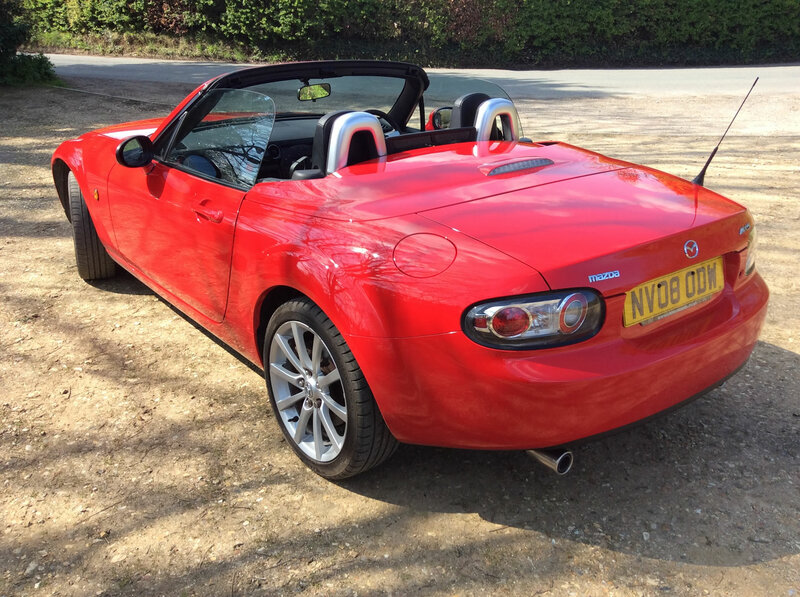 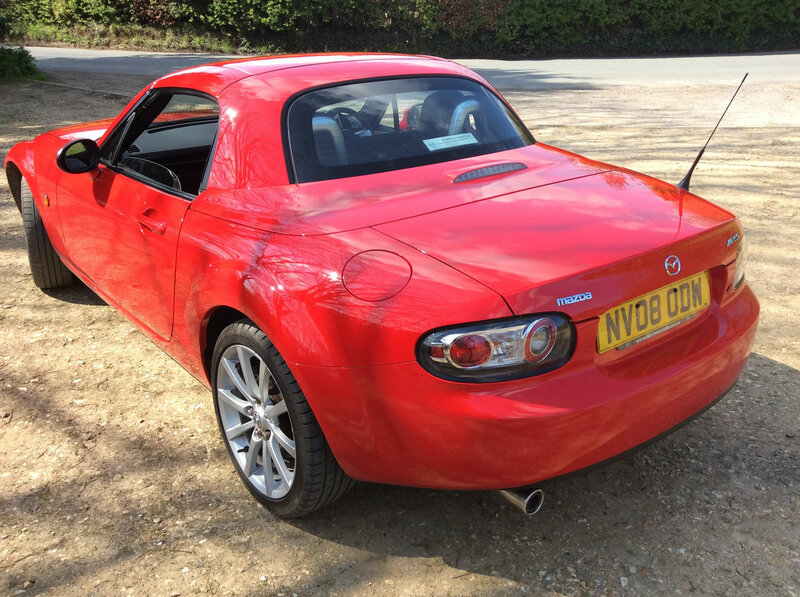 Mazda MX5 Sport, 2008, 2ltr Six speed, finished in red with black interior, Electric folding hood, 2 keys, 46,000mls. 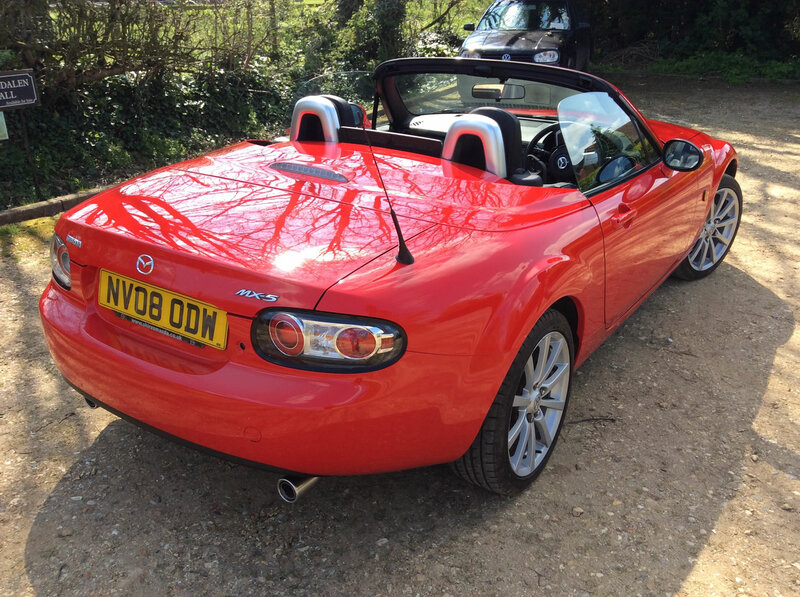 Service history, Will have a new MOT upon purchase. 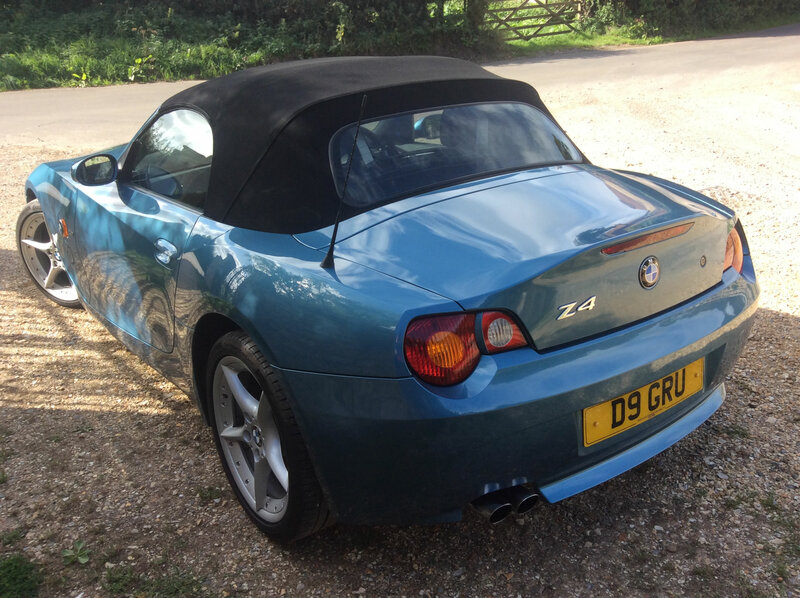 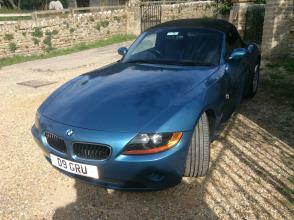 BMW Z4, 2.2I SE. 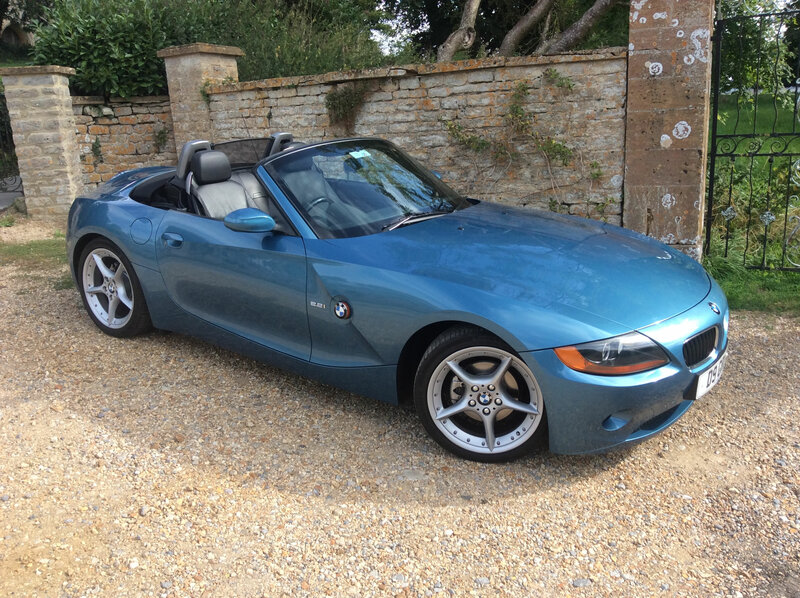 2004, in Metallic blue, 94,000mls. 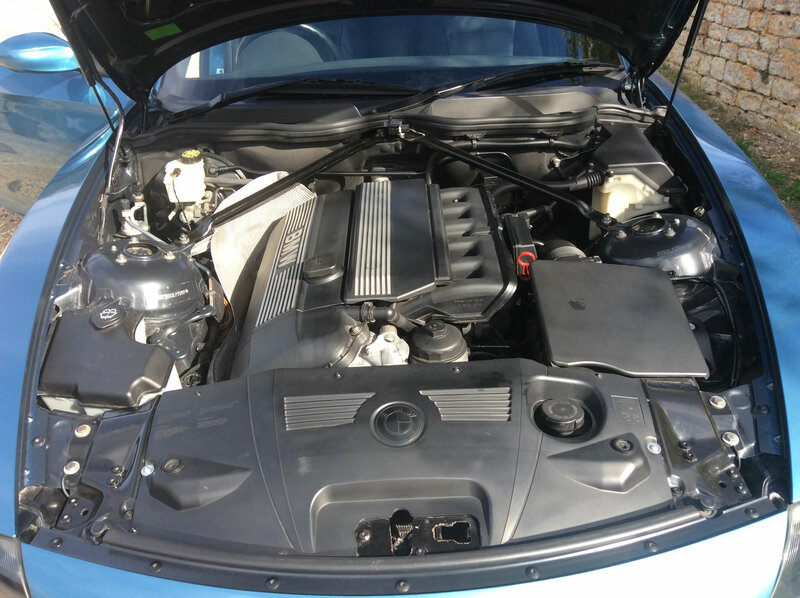 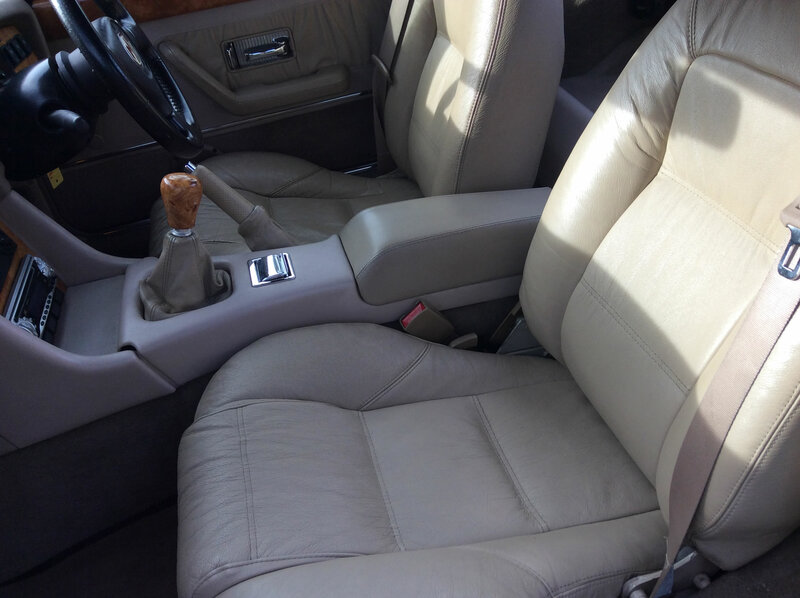 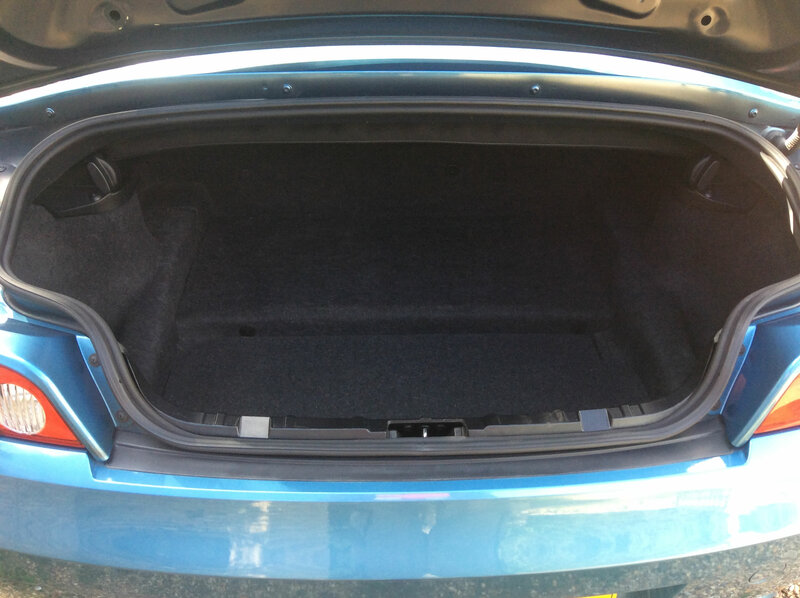 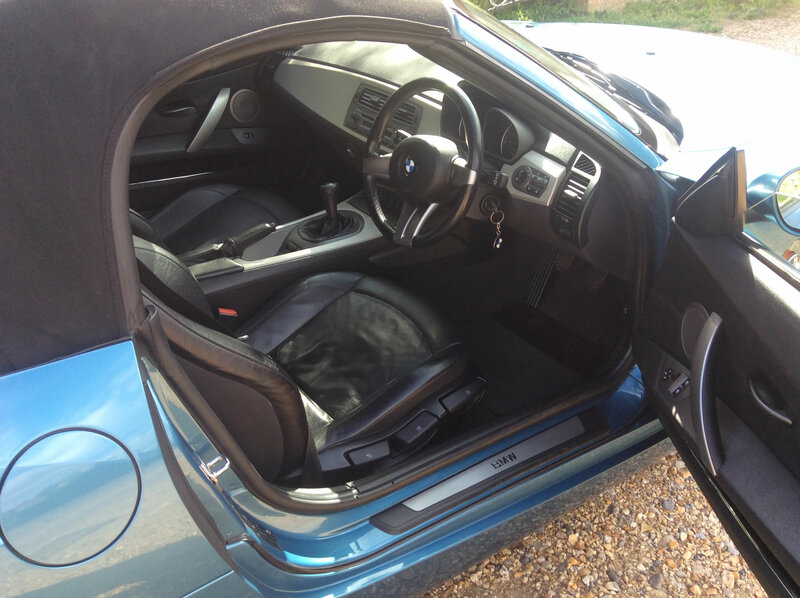 This car comes with a full MOT and service history, it has black leather seats, electric hood, cruise control, windstop and very nice number plate, it is in excellent condition inside and out and drives beautifully. 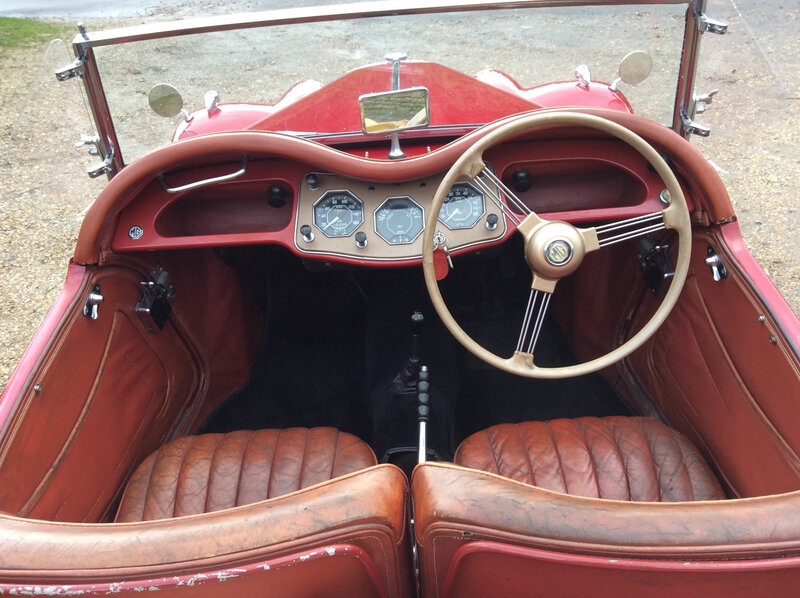 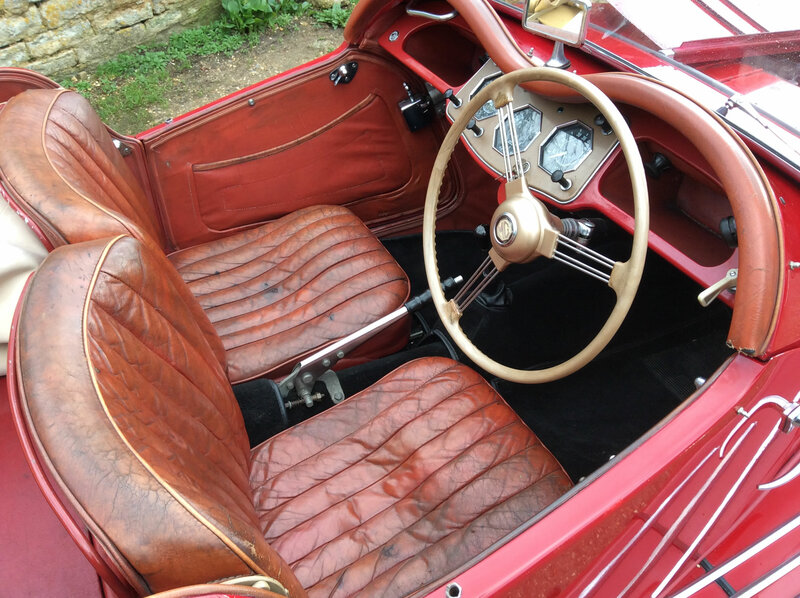 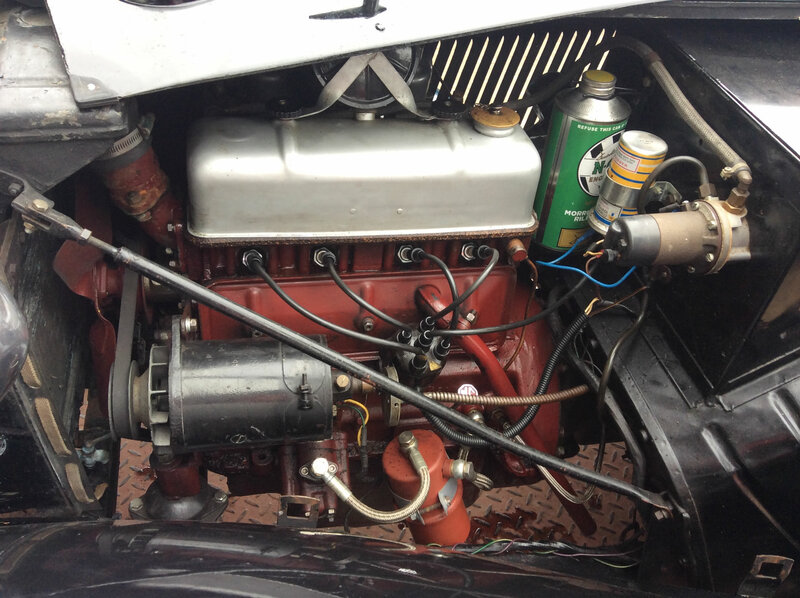 MG TF 1954, 1250cc, Red with original red interior and black carpets. 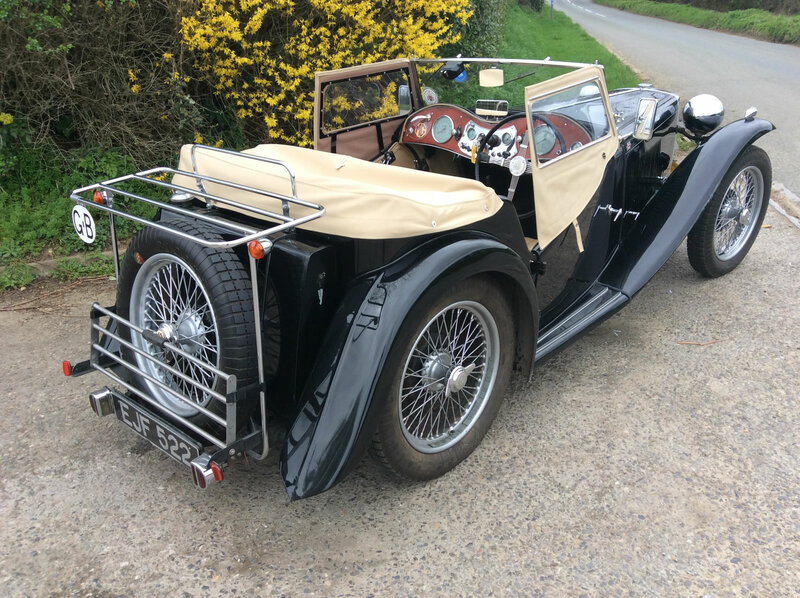 This car was originally exported to Switzerland and was always been right hand drive, in 2001 it was re-imported to this country after having a mechanical restoration over there. 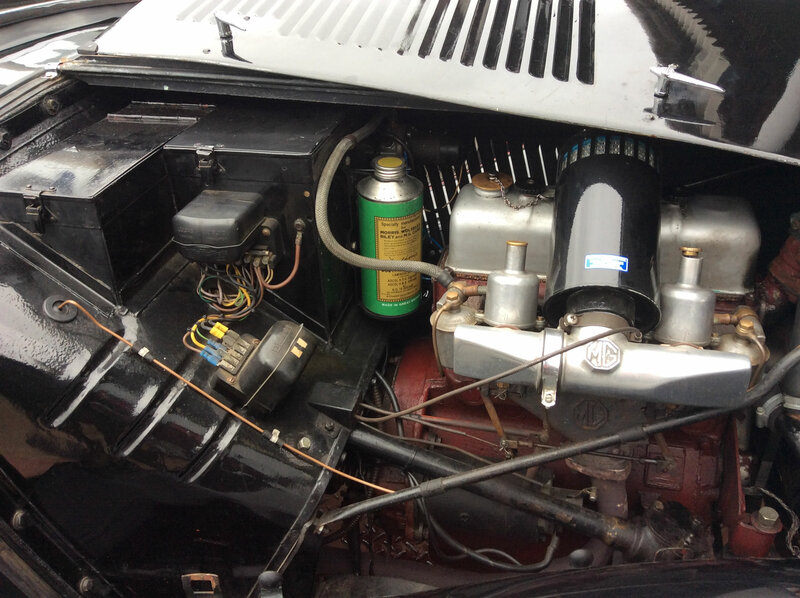 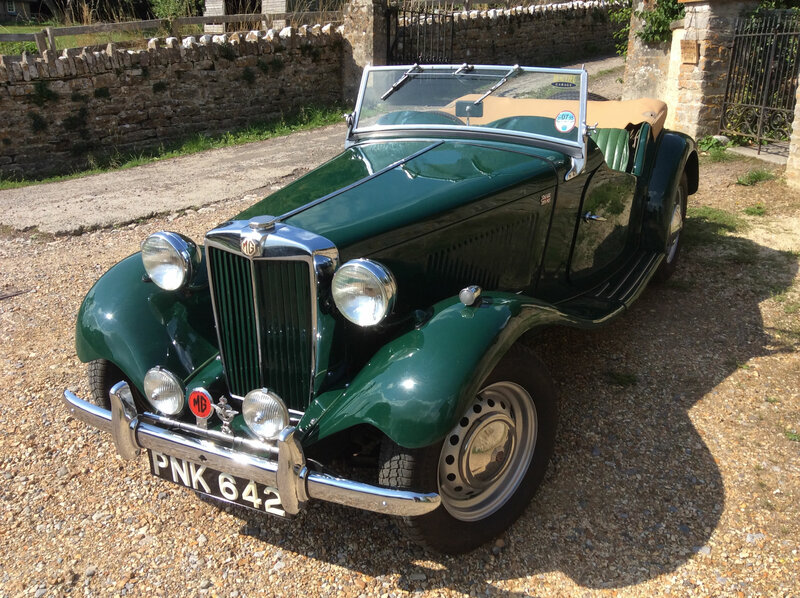 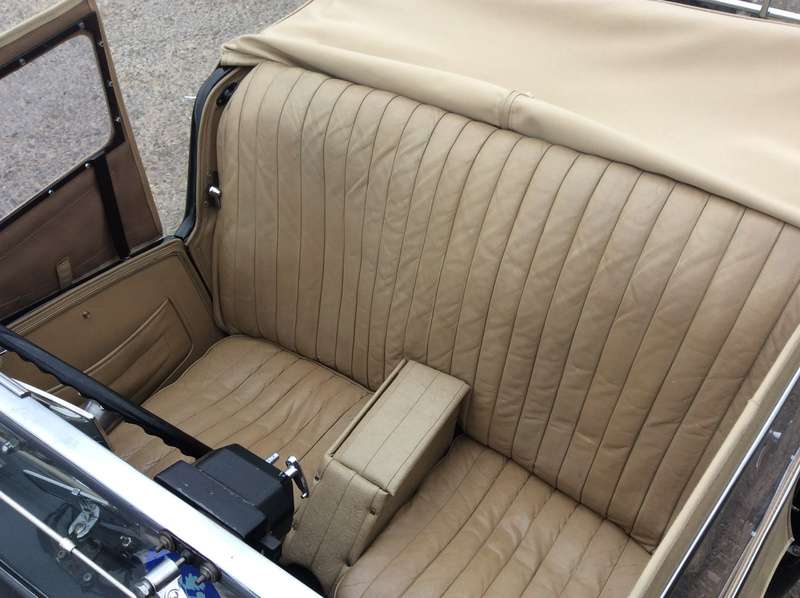 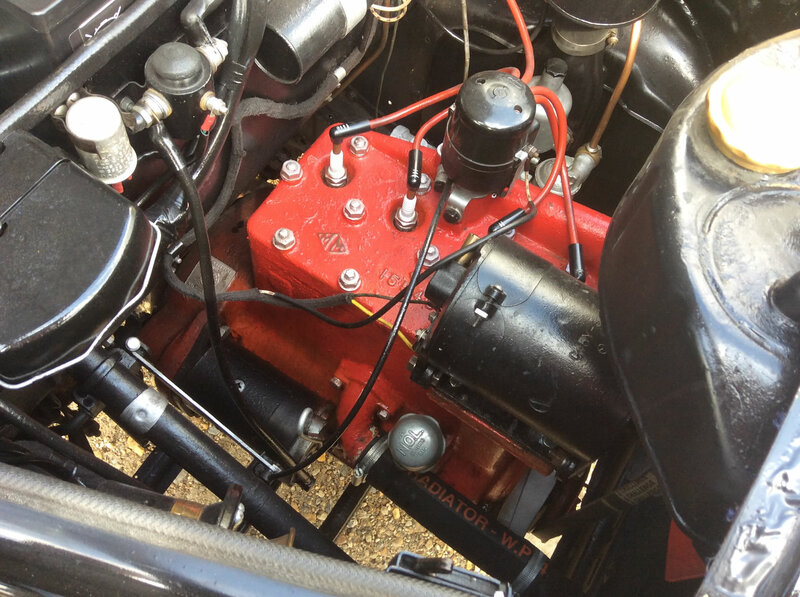 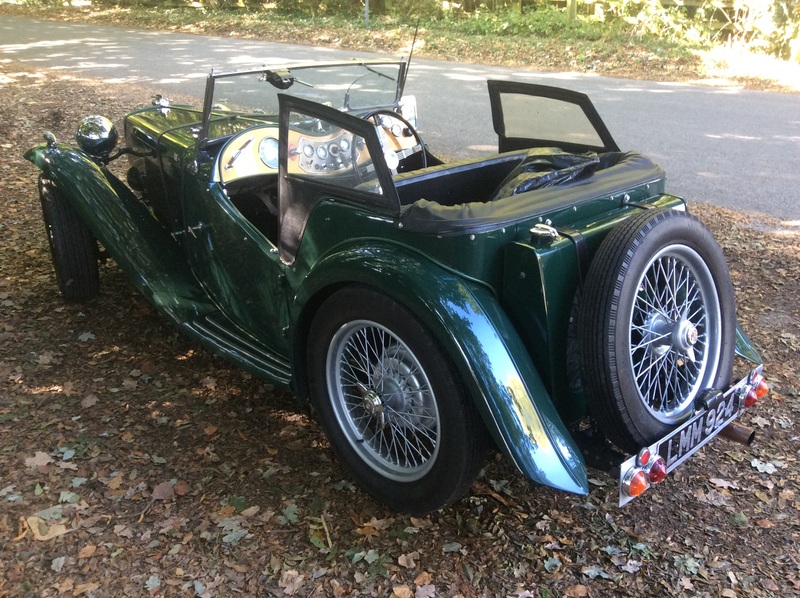 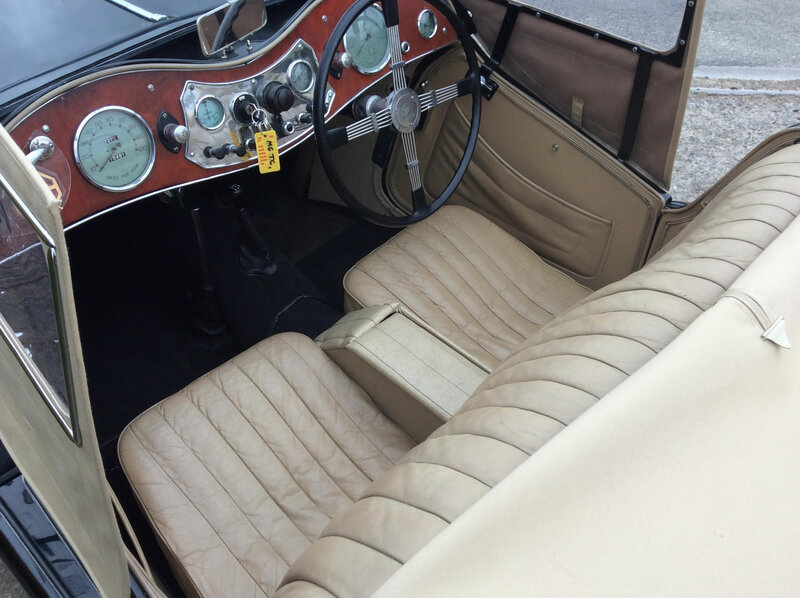 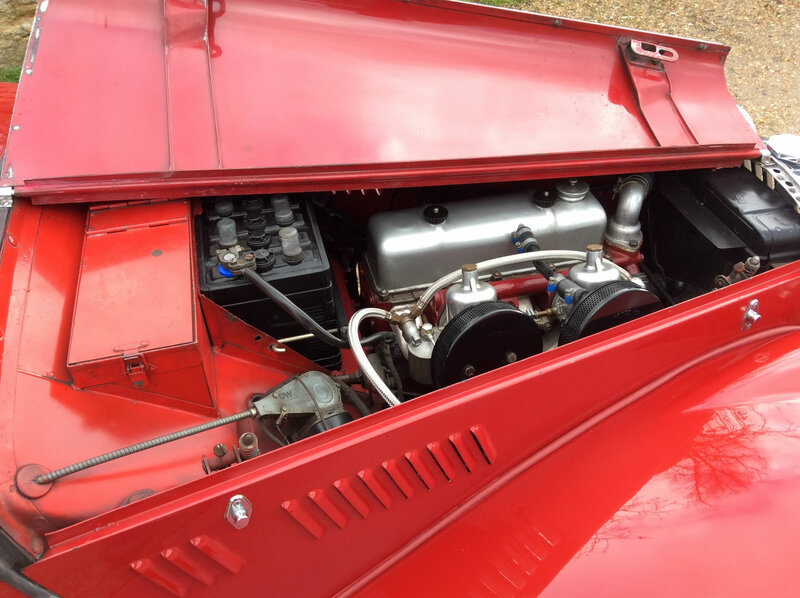 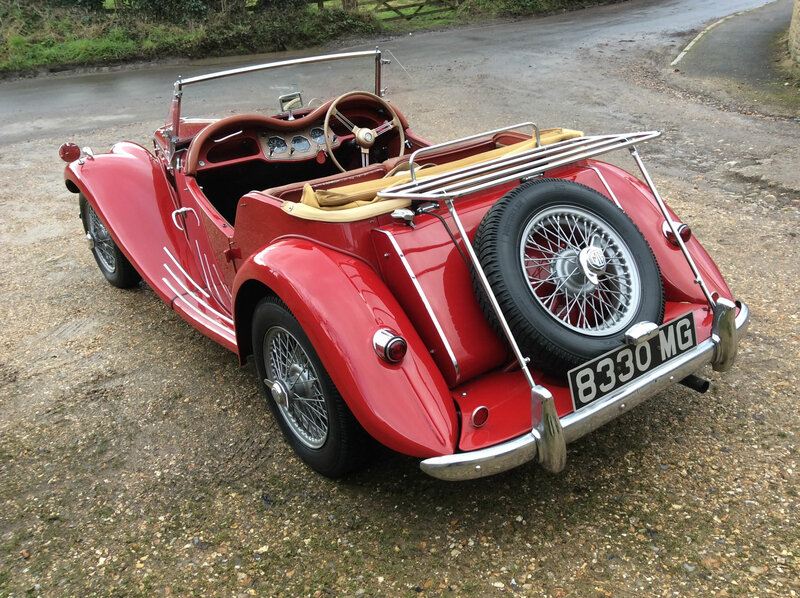 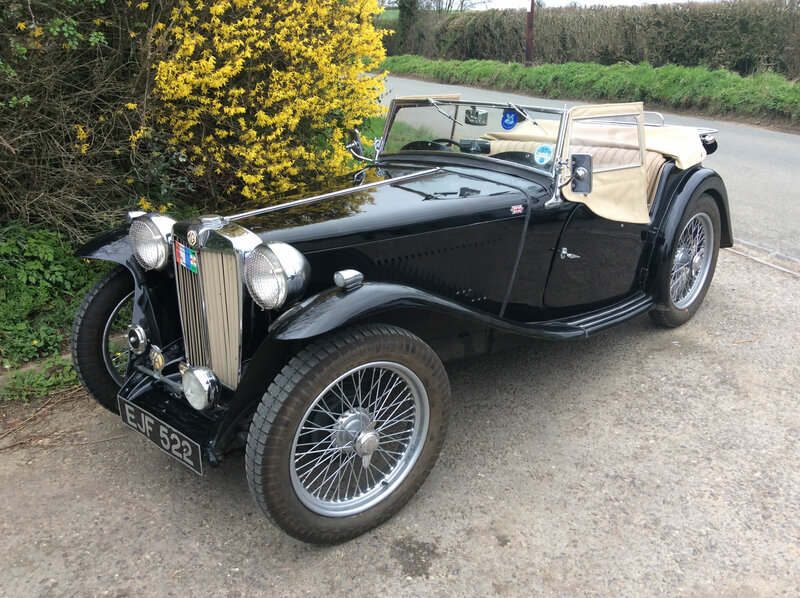 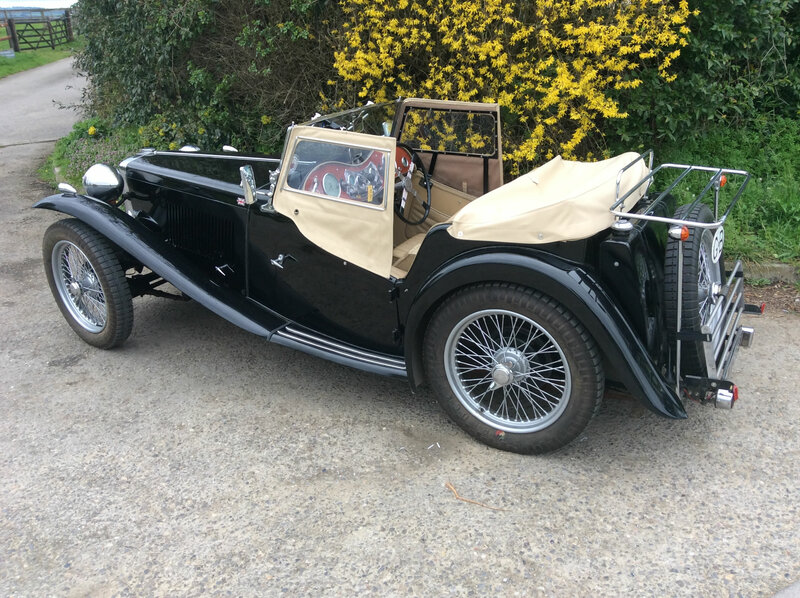 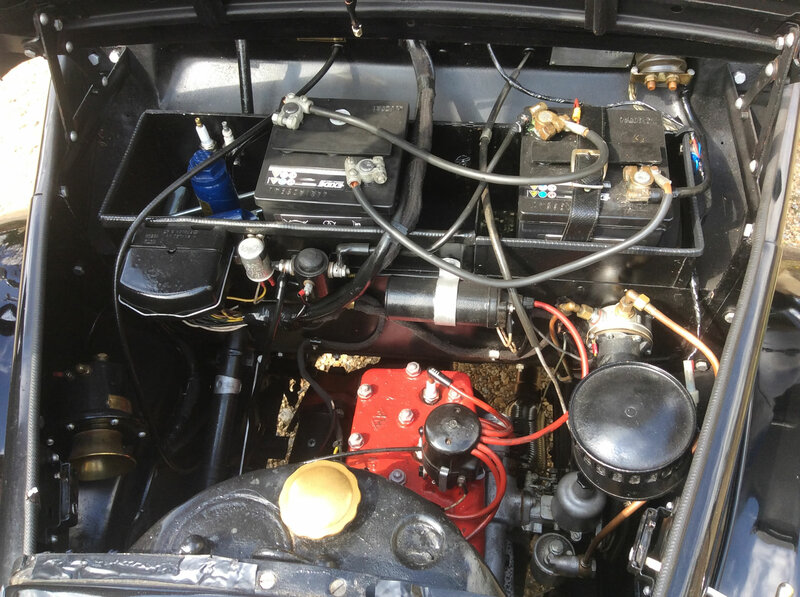 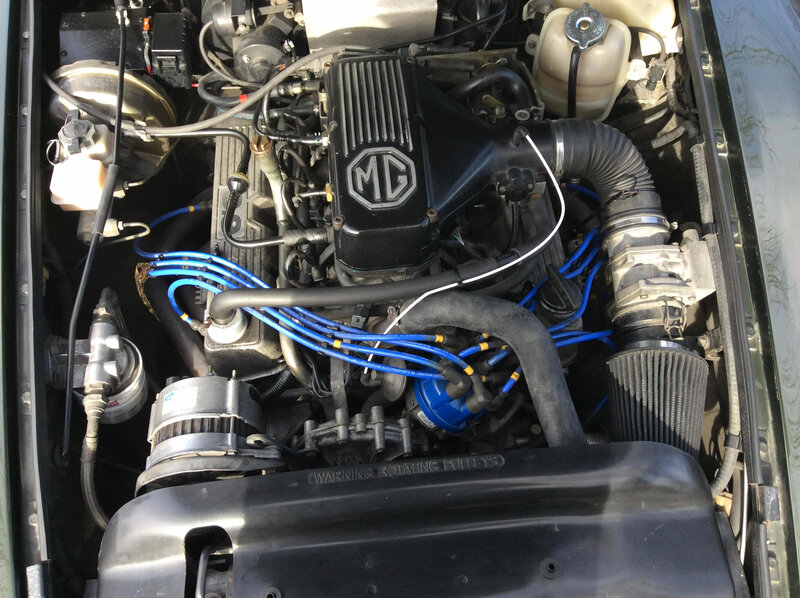 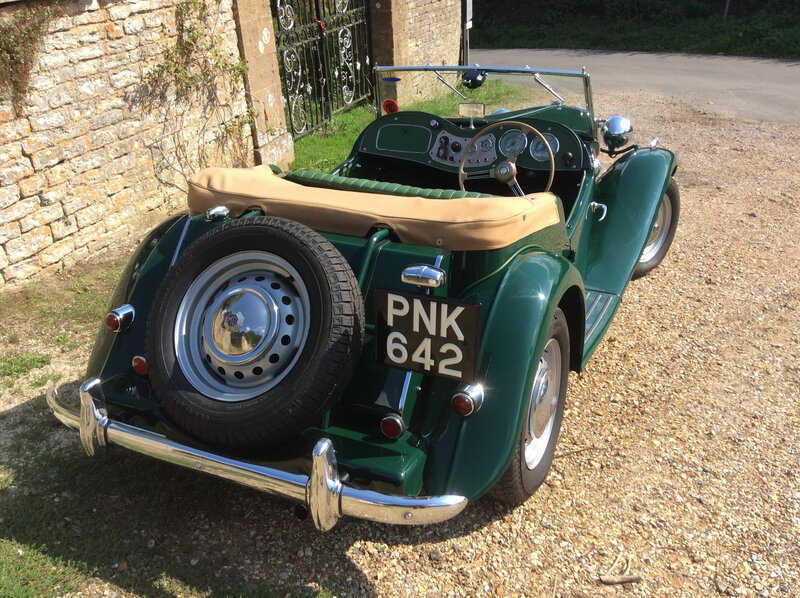 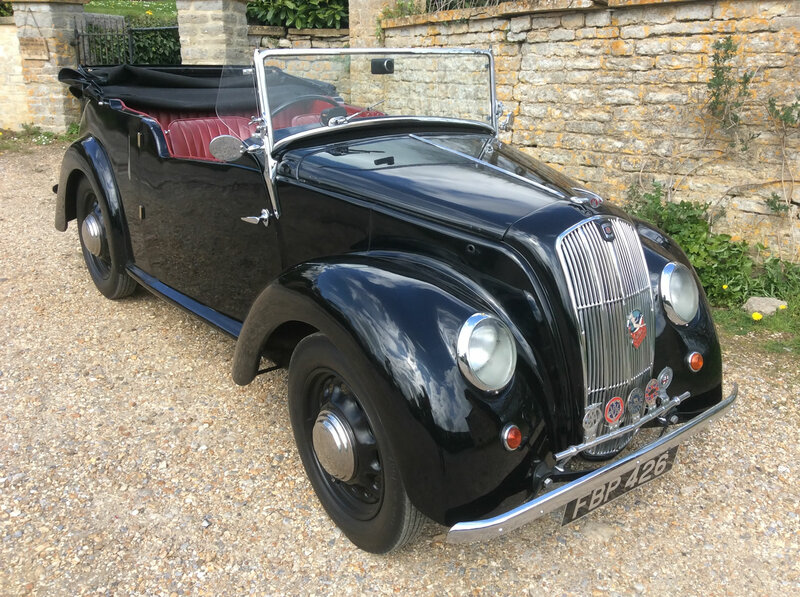 It is a very genuine car with a great MG number plate, lovely history with black and white pictures of the family that owned it when new, it has recently had new wire wheels and tyres fitted and comes with good weather gear and heritage certificate. 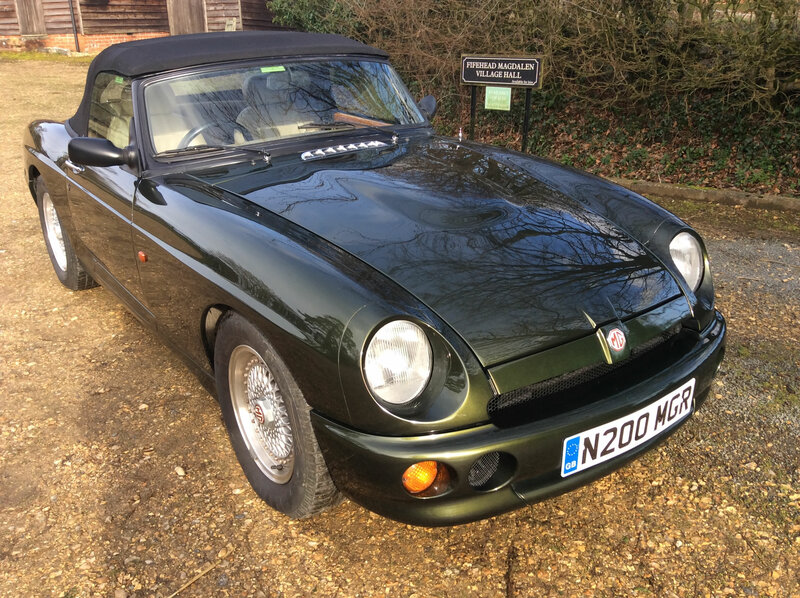 MG RV8,1995 finished in Woodcote Green, the car was re-imported back to the uk in 2005 and has only done around 50,000mls from new. 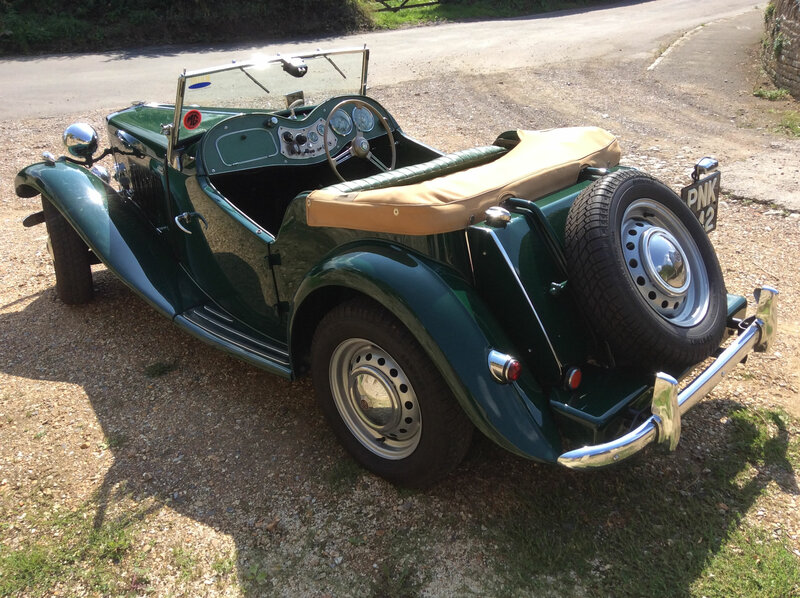 The car has recently been fitted with electric power steering and a new hood, it comes with a very nice MGR registration number, good history files, MOT to June of this year and looks and drives superbly. 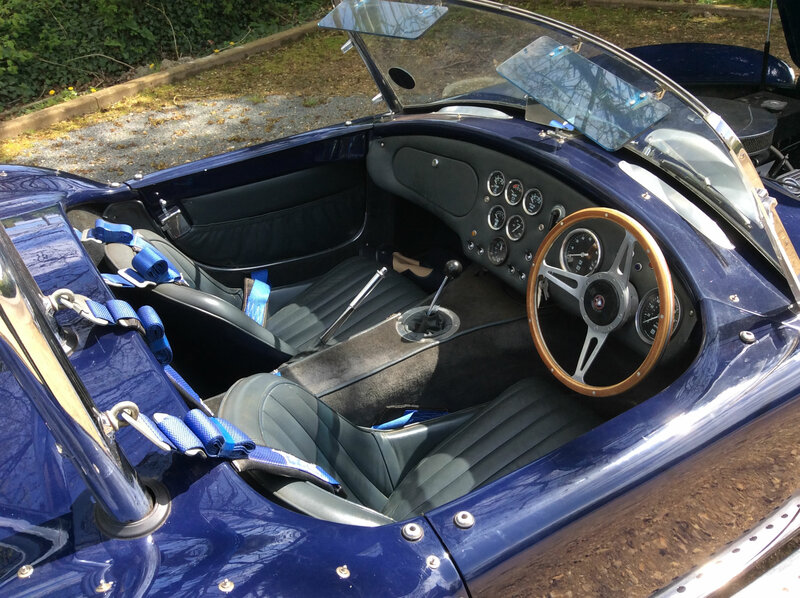 Dax 427 Cobra, 1973, Built between 1984 - 1988 using number one of a series two chassis, Jaguar series two front suspension and Jaguar S Type rear suspension and Spax shocks all round, it has a Chevy 5.7ltr engine with a Getrag gearbox. 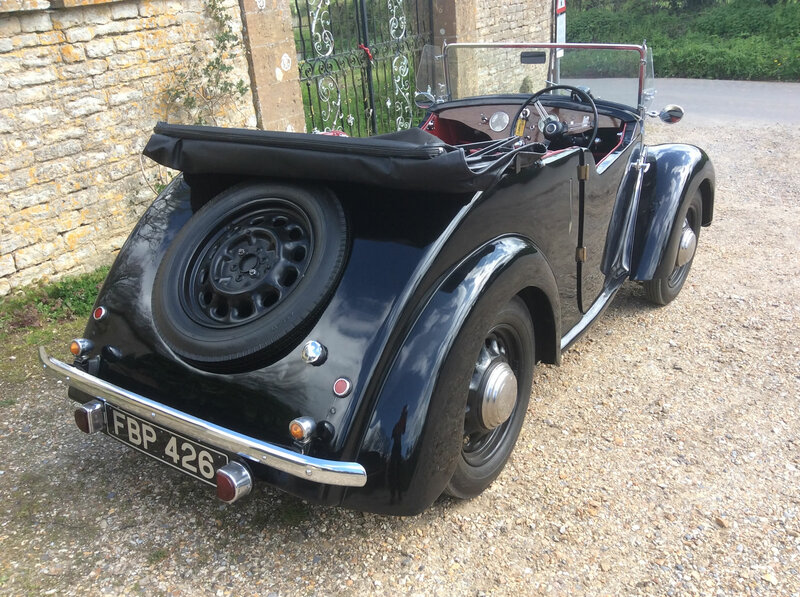 The car is finished in dark blue with grey interior, it is MOT'd until May 2019 and comes with good history file with invoices etc. 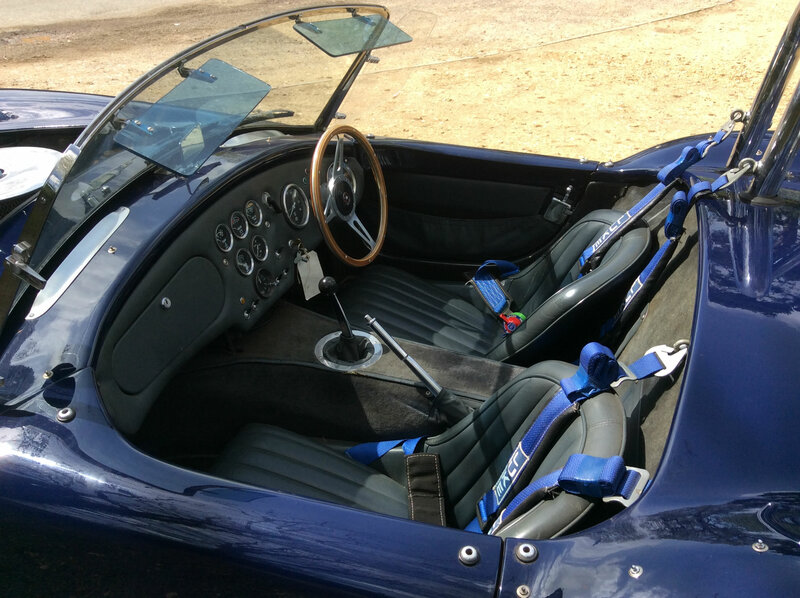 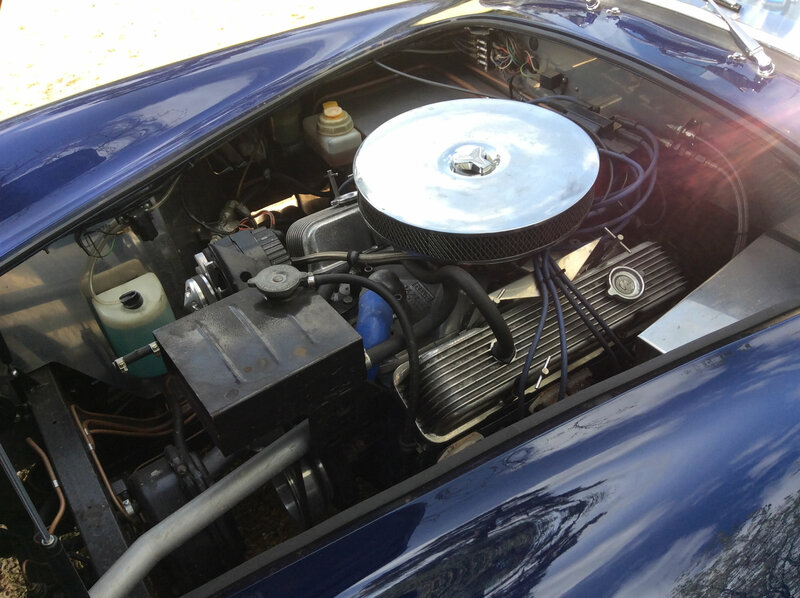 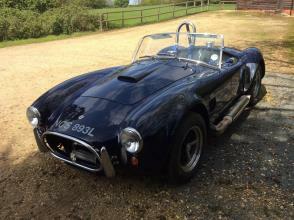 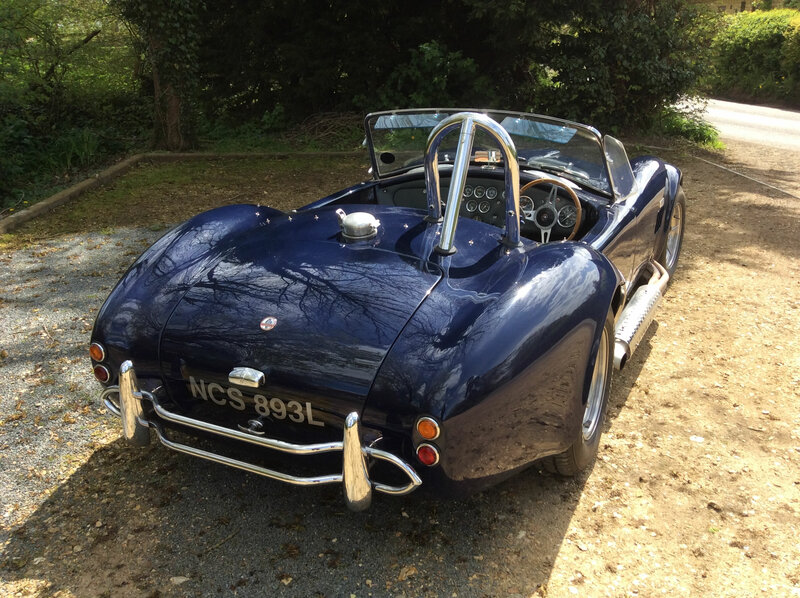 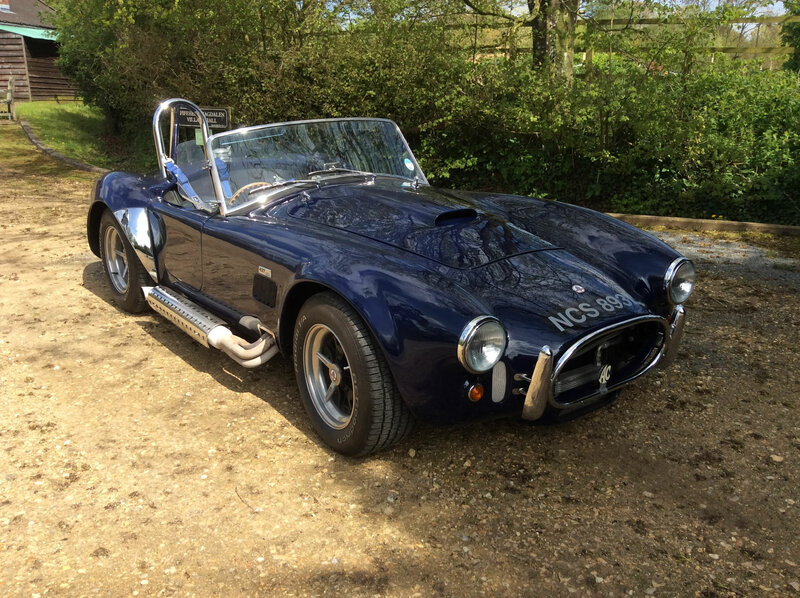 This cobra is now a historic vehicle so tax exempt and has been built to a high standard. 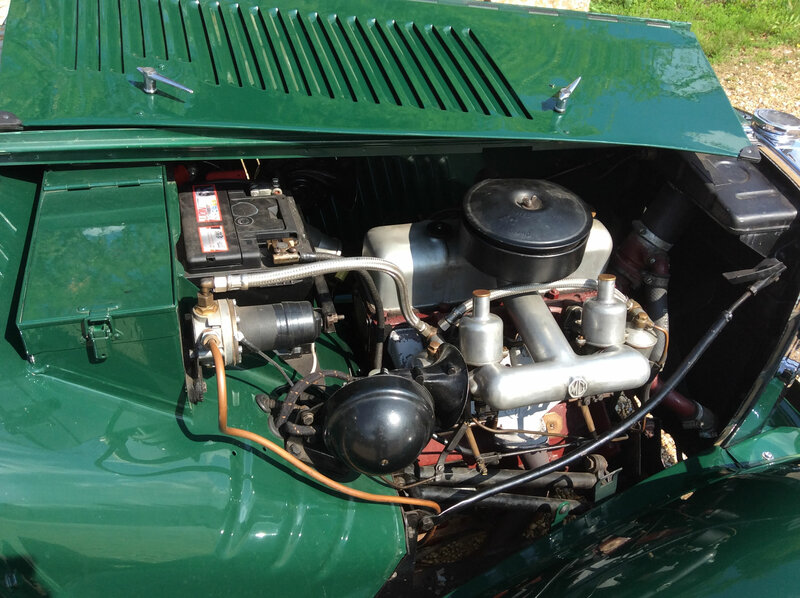 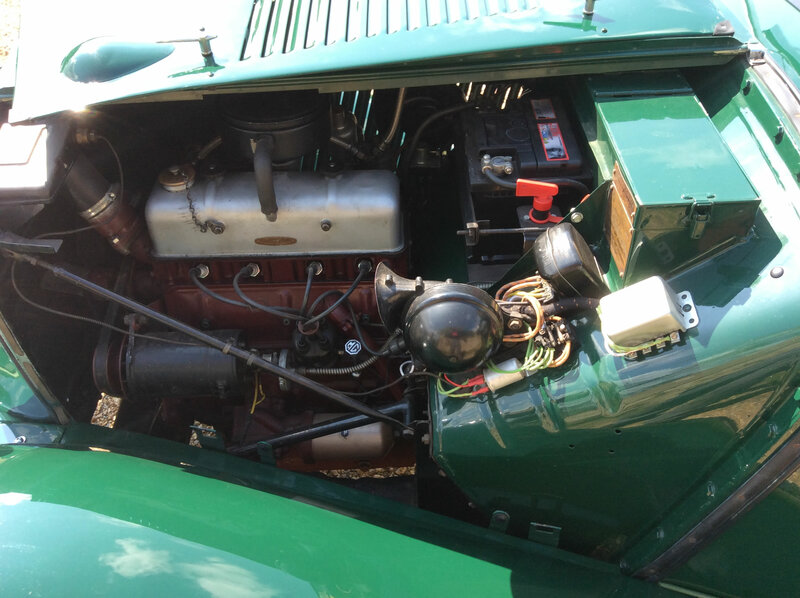 MG TC, 1948, British Racing Green, fitted with a re-con engine and 5 speed gearbox supplied by Andy King and has only done 1,500mls since fitted. 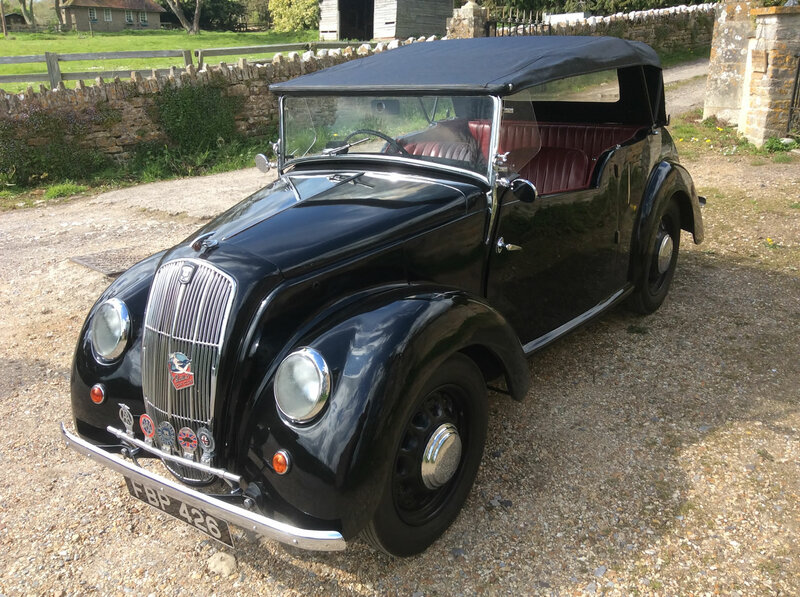 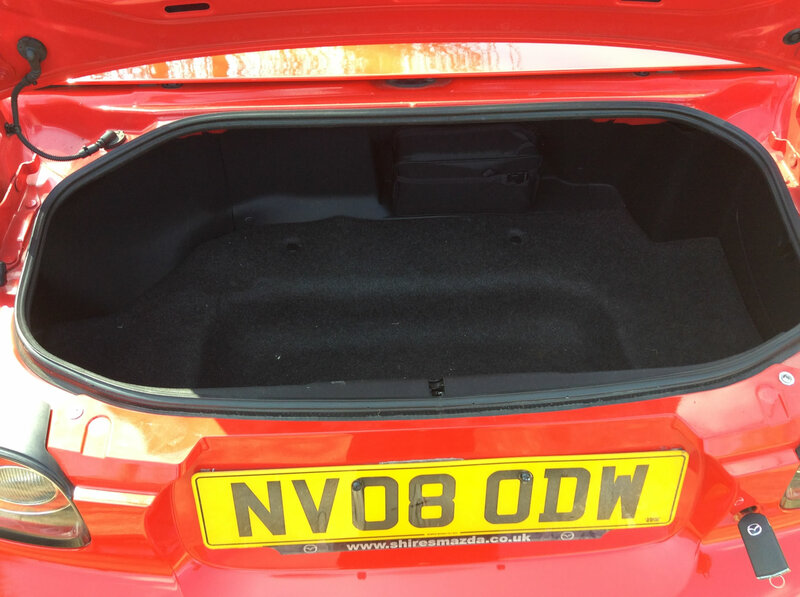 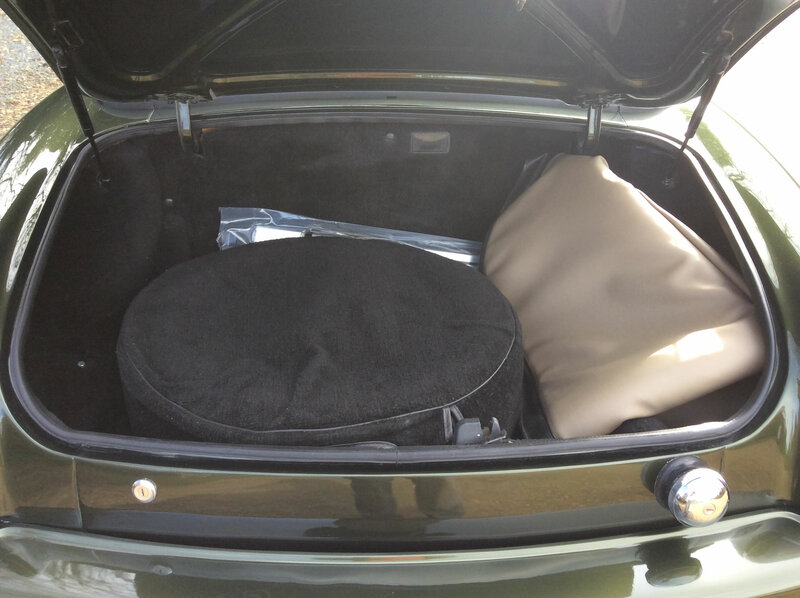 The car has black interior, aero screen, telescopic shock absorbers at the front, 16in wheels at the front and 19in wheels at the back, good hood, weather gear, (side screens a little tatty) and history file. 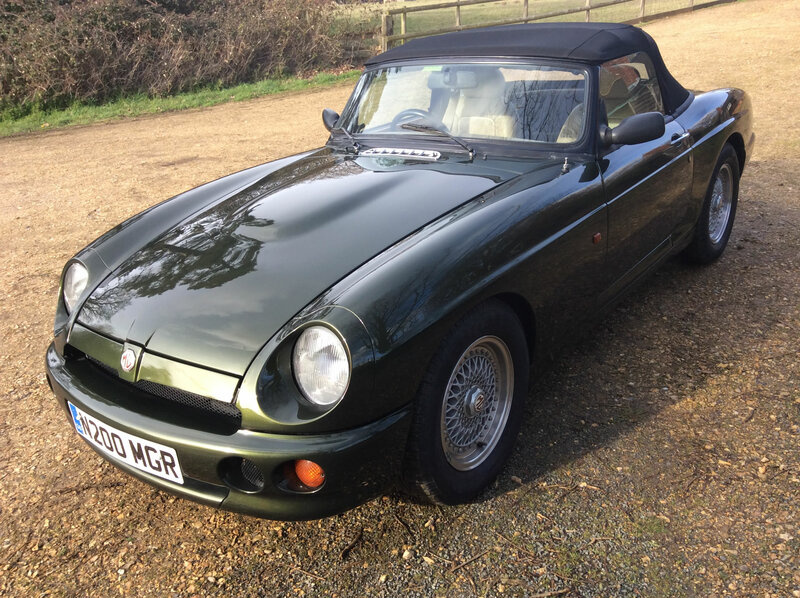 The is a very good usable classic which is lovely as is but could be improved if wanted.